Shinjuku Gyoen National Garden (新宿御苑, shinjuku gyoen) is a large Garden park located in East side of Shinjuku. It has not only Japanese style garden, but it also has British style and French style gardens. Especially British style garden has huge open field. If you feel tight in Tokyo air, visit this garden to relax. This garden is originally built around the beginning of Edo period. In 1906, it became a part of Imperial Garden, and opened public in 1949. It has very unique scenery which has great view of gardens with Shinjuku Skyscraper as the background. It has great collection of flowers for all seasons. Especially in the spring, you can enjoy great Sakura in this garden. Admission fee: 200 yen, 50 yen for kids. Shinjuku Gyoen was constructed on the site of a private mansion belonging to Lord Naito, a "daimyo"(feudal lord) of the Edo era. Completed in 1906 as an imperial garden, it was re-designated as a national garden after the Second World War and opened to the public. With 58.3 ha(144 acres) in size and a circumference of 3.5 km, it blends three distinct styles, French Formal Garden, English Landscape Garden and Japanese Traditional Garden, and is considered to be one of the most important gardens from the Meiji era. Among the 20,000 trees which grow in Shinjuku Gyoen, there are the first examples planted in Japan such plants as tulip trees, planes, Himalayan cedars and bald cypresses, whose distinctive crown shapes give the garden a solemn and dignified atmosphere. The site of Shinjuku Gyoen National Garden was one part of Edo residence being given to Kiyonari Naito, who was the vassal of the genealogy, by Ieyasu Tokugawa, who created the Edo castle and was given the eight states around Kanto region by Hideyoshi Toyotomi in 1590. This so huge land reached to Yotsuya in east, to Yoyogi in west, to Sendagaya in south, to Okubo in north, where the strategic points to cross between the road from Edo to the west including the Kosyu and the Oume road, and the Kamakura road. Because of the military purpose, Ieyasu gave this area to the reliable vassal. Kiyomasa, the seventh generation of Naito family, became the lord of Takato castle in Shinsyu region, whose harvest was about 170 U.S. bushels in 1691. The residence of the Naito family was so excess comparing with its amount of income that considerable part of the land was gave back to the shogunate. However the remains was more than 33ha in 1872. Shinjuku Gyoen was created in the area of 58.3ha, which included over 31ha that belonged to the Naito family. And the neighbouring land that was private owned at that time but once belonged to the neighbour residence of the Naito family. For the reasons stated above, the origin of Shinjuku Gyoen National Garden was based Edo residence of the Naito family was purchased. In 1872, in order to promote modern agriculture in Japan, the government established Naito Shinjuku Experimental Station in the area of 58.3ha. In this station, extensive studies were practiced such as the cultivation of fruit and vegetable, sericulture, stock farming, including Western technique and species. And in 1874, it was placed under the authority of the Department of Interior and the new educational institution for agriculture was established. In the expansion of agricultural promotion by the new government, some parts of the function of Naito Shinjuku Experimental Station were transferred to the others and it newly started out in 1879 as "Shinjuku Imperial Botanical Garden" belonging to the Ministry of Imperial Household. So we might say that if one part of the vast residence of the Naito family had not been kept as Naito Shinjuku Experimental Station during the revolution period between Meiji and Taisho, today's Shinjuku Gyoen National Garden would not have been able to exist. 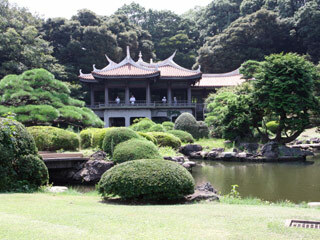 In the period of Shinjuku Imperial Botanical Garden, a duck pond, a fish-breeding pond, a zoo (given to Ueno zoo as an imperial grant in 1926) were constructed around the today's Japanese Traditional Garden and they were managed as an Imperial estate and farm belonging to the Imperial Household. For the aim of making model farming, the cultivation studies about fruit and vegetable had continued. And it was the first trial in Japan about orchid cultivation and other flowers by using greenhouse so that they made efforts to import Western horticulture and to spread the technique to ordinary citizens. Although it was a pity that the plan at that time was burned in the air raid in 1945, according to the bird's-eye view drawn by Martine, it was mostly similar to the present with the exception of the building on the right-hand side of the center, so the garden was thought to have been built by the plan of Martine. Shinjuku Gyoen National Garden was completed in May, 1906, after 4 years since 1902. There was a opening ceremony with the celebration of the Russo-Japanese War with the attendance of the Emperor Meiji. Although it has been unknown the details from between remodelling to the realization of the development planning, it has been thought to be greatly influenced by the existence of Fukuba, who went to France and Germany to study flowering and fruit horticulture in his young ages and was well informed to most Western horticulture. At the beginning time Shinjuku Gyoen National Garden played a role as the garden for the Imperial, it had been continuing to supply the cuttings and seeds of buttonwoods (sycamores) and tulip trees (liriodendrons) for the roadside tree in Tokyo. However, since then, it was enriched the contains and managements of cherry trees and chrysanthemums because the garden was firmly established for the party of watching cherry blossoms since 1917 and for the party of watching chrysanthemums since 1929. Also, during Taisho era, the Western garden was used for nine-hole golf course and the Western style rest station (former Japanese style) in the days of Shinjuku Gyoen Botanical Garden was remodelled and used for a clubhouse too. In 1935, the shadows of the war started to cover the garden, then the air raid in May, Showa 20th, the garden was almost completely burned out and was greatly damaged with the exception of Taiwan Pavillion (former Goryotei Pavillion). After the war, though it was temporarily established Tokyo municipal agricultural science training school for higher education, the Shinjuku Gyoen National Garden became under jurisdiction of the Ministry of Health and Welfare as well as the Outer Gardens of the Imperial Palace and Kyoto Imperial Garden in 1950. Then on 21st of May, 1949, it was opened to the public as "Shinjuku Gyoen National Garden ". After that, with the Environment Agency inaugurated in July, 1971, the garden was moved the jurisdiction to the Agency as well as other national parks in Japan. And due to the reorganization of the government offices in January, 2001, the garden is under jurisdiction the Ministry of Environment so far.